The name of this Stone comes from two Greek words "chrysos" and "kolla" meaning "gold" and "stick". The word chrysocolla used to describe a series of material that were used to work with gold. Copper was extracted from it and was used to solder gold. It eventually referred to only one type of mineral which was a silicate of copper hydroxide. You can see some traces in this rock made of crystalline masses or veins with a deep and intense shiny green or blue color. It can be easily confused with dyed chalcedony, turquoise, malachite, variscite or azurite. The chrysocolla stone is quite fragile due to its composition made of copper and of his water proportion. This is the reason why it is generally mixed with other minerals to solidify it in jewelry use. 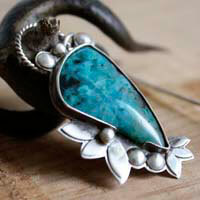 Most of the time, it is with malachite, azurite or cuprites. It is linked with the moon, the feminine symbol, water and emotions. This stone has been known since the Antique period and was describe by the Greek Theophrase in 315 B.C. it was then mainly used to solder gold. 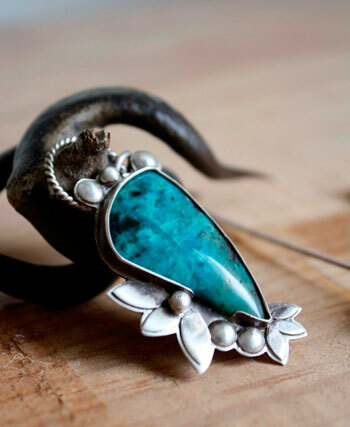 Egyptians knew the chrysocolla stone under the name of "the stone of wisdom" and would commonly wear it when negotiating in order to feel relaxed, but also to protect their mind. During the Middle-Ages, the chrysocolla stone was mainly used for its medicine properties. It was thought that it could cure ulcers and stomach aches. During the Renaissance period, the chrysocolla was used as a pigment to make painting. This stone is generally considered as a talisman helping to strengthen the physical resistance as well as bringing peace by the Indians from America. The chrysocolla would strengthen muscles in arms, feet, the abdomen and the back. It would be good for throat and laryngitis infections. The chrysocolla would help with arthritis and bone diseases.